The Cumberworth project already had pre-existing triple glazed windows from Green Building Store, with a whole window Uw value of 0.9 W/m2K, installed in two phases, over the past 6 years. The clients obviously didn’t want to change the recently-installed windows, so we had to work with them to ensure that our internal wall insulation strategy joined up with the internal window reveals. Given the size of the window openings and window frame, you obviously can’t have the same thickness of internal wall insulation running into the reveals. Space-saving insulation products like vacuum insulated panels (VIPs) obviously come into their own in this situation. VIPs panels offer a solution for insulating around existing windows and can also offer a solution if you are replacing windows but need to maintain the size of your window openings. If you were replacing windows with thicker frames it would reduce the light entering the building, so VIPs could offer a space saving solution in that situation too. The window openings on the Cumberworth project can be quite small, as it is a barn conversion project, so the VIPS panels also helps us maximise light. 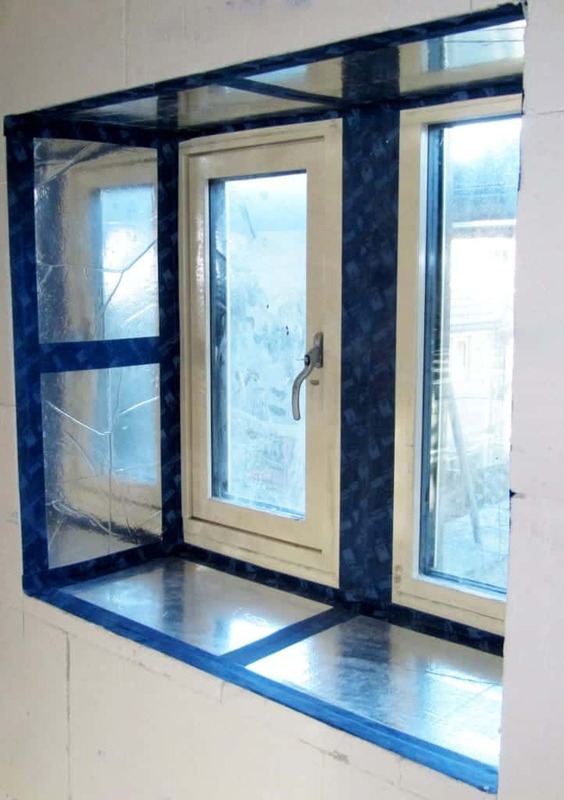 Of course outward opening windows work better with internal wall insulation (IWI). Outward opening windows give you more opportunity of insulating the reveals inside because you’ve got a bigger thickness of frame for the insulation to go into. If you are working with an inward opening window, the smaller part of the frame would be inside, giving you less room to play with. The make-up of the window reveals at the Cumberworth project are slightly different for both wall types (eg the solid walls in the barn and the cavity wall in the newer extension) but the principle is the same in both. We parged the masonry in the reveals for windtightness, using a sand and cement mix. Then we glued (using a suitable proprietary adhesive) a 10mm thick Kevothermal VIPs panel on top and then placed 9.5mm of plasterboard on top. At the bottom of the reveal we then added a standard timber window board. The maximum thickness we could use for the VIPs was 10mm, because by the time you put 9.5 mm plasterboard on top, that was the amount of space we had left to play with without interfering with the window opener. The lamda value of the Kevothermal VIPs panel is 0.007W/mK, which is three times better than polyurethane at this given thickness, Using the space-saving VIPs panels means we’ve got a better continuity of insulation and U value. This helps the insulation run continuously from the window through to the internal wall insulation, thus alleviating the problem of a cold bridge. If we didn’t insulate the reveals in this way, there would be substantial problems of mould and condensation. 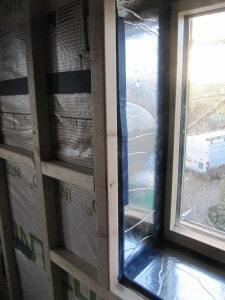 We also had to pay close attention to airtightness at the window reveals. The VIPs panel becomes the airtightness layer in its own right. 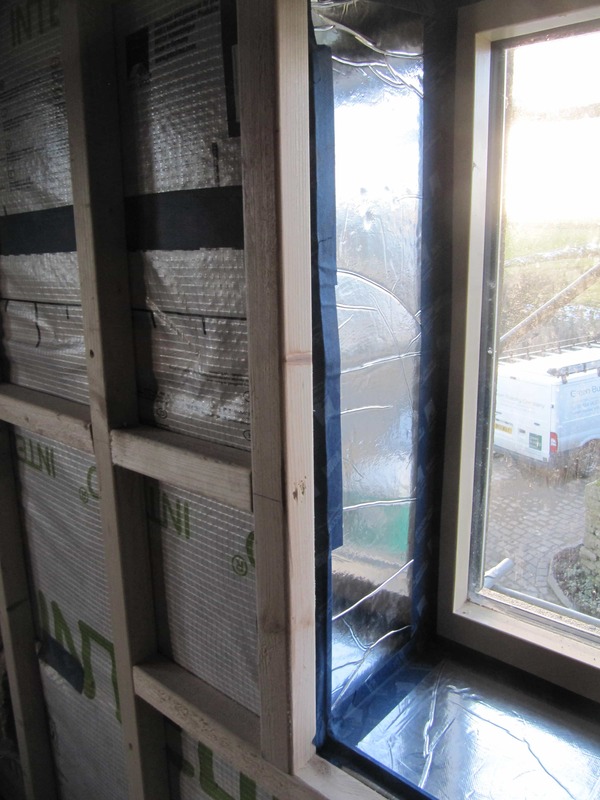 For the cavity wall section of the build, we taped in the Intello airtightness and vapour control membrane to the Kevothermal VIPs panel and then the VIPs to the window frame and then added new plasterboard on top, so that the airtightness barrier is on the warm side of the insulation. Initially there was an idea to bring the Intello up to the window frame and then put the VIPs on top of it, but this would have been the wrong order. The Intello membrane would be cold in the reveals and any humid air could have caused interstitial condensation on top of it. To avoid this, the airtightness barrier/ vapour control needed to be on top of the insulation. We’ve also used the VIPs behind the string of the existing stairs, for space-saving reasons. We’ve decided not to move the stairs, as to have had to install 4 inches of internal wall insulation behind the stair strings would have required a lot of alterations and structural works. So, instead, we’ve put 20mm of purpose-made VIPs panels behind the string, which has meant that we haven’t had to move the stairs. The advantage of using the vacuum insulated panel (VIPs) insulation system is obviously its space-saving qualities. One disadvantage of this system is that the building team have to ensure that they do not puncture the VIPs panel during installation. In this case, the building team found working with them straightforward. Obviously our clients are aware of where the VIPs panels are located, but future homeowners will need to be made aware of the location of the VIPs panels to avoid inadvertently puncturing them. I think we’ve done the best we can to ensure continuity of insulation and integrate the existing windows with the IWI strategy. This offers a good illustration of the need for a ‘whole house plan’, that we talked about in our Warmer Homes project. Even if you do energy efficiency measures in stages (eg install triple glazing before internal wall insulation) they can all join together eventually, if you plan things carefully. In the next blog we’ll be looking at the ground floor and intermediate floor strategy at the project. Great work as always folks. Would you mind giving a budget cost for the VIP material cost for say for a 1800mm wide x 1200mm high opening , 200mm wide reveal – in Ireland. How did you secure the internal window board to the window in the phote above w/out punctres to the VIP liner? For that size window opening the VIPs would be supplied as 4/900mm by 200mm and 4/600mm by 200mm. Say 20mm thick we are looking at approximate £95.00 net plus delivery charges. We have used a laminated pine window boards at Cumberworth to resist ‘cupping’ and used the recommended silicon adhesive Dow Corning 895. We have also skew pinned into the bottom rail of the window. There will need to be a knowledge transfer between house occupiers on how not to puncture the units. If punctured the lamda value goes from 0.007 to 0.022 the equivalent of polyurethane, so there is not a total failure if a mistake is made. Have you assessed the hygrothermal impact on the existing wall of such high levels of IWI? A Wufi analysis is cheap and quick and will indicate if there is likely to be a problem. A damp wall has a higher thermal conductivity, will promote mould growth and can result in the mortar degrading. There is even the possibility of frost heave. The primary effect of the VIP in the reveal is to eliminate the surface condensation risk (at least, as you point out, until someone installs a roller blind thereby puncturing the VIP). Moving the windows backwards into the insulation zone might be a more effective way to achieve the same end and is considerably cheaper than VIPs, even allowing for deeper cills. We have carried out WUFI analysis on all the wall elevations and the different wall constructions. As we talk about in the previous blog, we have over 50 moisture sensors throughout the building continually measuring the moisture in the masonry, at different points through both insulation methods, and in timbers built into external walls. The sensor batteries last for approx 3 years and hopefully the information we gather over the different seasons will help inform future IWI strategies. Your second point about moving the windows back in line with IWI instead of insulating the reveals would probably make sense thermally, but from the constructional and architectural angles it would not work for this project. Existing positions/depths of masonry cill, lintel and jambs, cavity trays and vertical damp-proof courses would all have to be altered. This would potentially be far more costly than using the VIPs panels and leaving the windows where they are, and would also be architecturally/aesthetically detrimental in this case.